Home » SD Connect C4 » Star Diagnosis C4 (SD Connect) with a Laptop. Full upgrade. Diagnostic system Mercedes SDConnect C4. 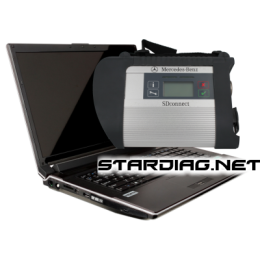 SD Connect 4 (Star Diagnosis C4) with laptop represent ready for operation diagnostic system Mercedes SD Connect Compact 4. Laptop Lenovo, Dell with installed, configured software Mercedes (Xentry DAS WIS EPC). You can choose the laptop you are interested in yourself. The range and prices of laptops with software installed, Mercedes, see Laptops for car diagnostics. Star Diagnosis C4 multiplexer with or without cables (5 pcs). The modified power diagram. Standby “standby” is replaced with the mode of “shut down”. The multiplexer and a complete set you are interested in you can choose independently in section SD Connect C4. Settings wireless network WiFi laptop and multiplexer Star Diagnosis C4 provide automatic connection between them immediately after the activation, which relieves the user from having to manually enter the connection settings. After WiFi connection is established, the diagnostic system is ready for operation. By purchasing this diagnostic system, the user doesn’t need to study algorithms setup and configuration diagnostic software Mercedes is that, given the complexity of the installation process, saves a lot of time. Diagnostic software MERCEDS Xentry/DAS is multilingual. However, the old model Mercedes (up to about 2004 V.) diagnosed in the application of HHT included in the DAS. The HHT application has English or German language only, some models are only available in German language, in particular beads, vans. The section “data for developers”,the so-called “menu Engineering” has German language only. Diagnostic software Mercedes has many special features. Some of which may only be available to authorized dealers.